You can create 3-state icons for each item: normal state, mouseover state, expanded state. Use images for icons, backgrounds of submenus and items. 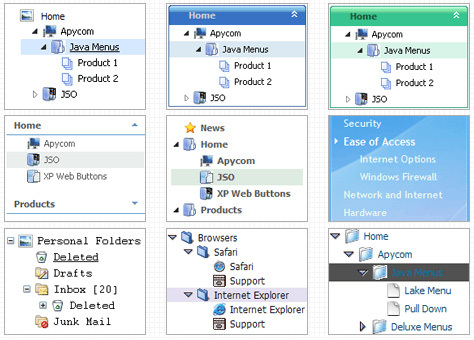 You can use with any amount of menu and submenus on one page. Q: I want to have one of the drop menus use a different image. I am using thevista images and would like to have all of them but one use the same imageand the last one a different one. Can this be done? If not I was able to adda second menu with the different image but for some reason the second menuwill not drop down. Can you help me with either of these? A: You should create Individual Style for the last item and assign another image for it. I am trying to put the menu in the left column of the table, a form on the right side, and then center the entire table. The html table is surrounded by a center tag (have tried a div tag with no difference). How can I fix this issue? I have also attached the html source code as it is rendered in the browser in case that is of some use. You're using absolute position for the menu now. Q: Will all your navigation bar examples work cross-frame? So you should create your menu in Deluxe Tuner, save it. Create html file with your frame set. This does not work. I had it somewhat working. Is there a better way to do this? I will want to have at least 6 popup windows on the same page. I could not find any samples on your website. 1) Call different data files with DIFFERENT winID:"window1"! 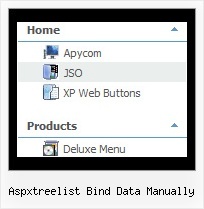 Creating Columns and Binding Them to Data Fields When the ASPxTreeList is bound to a data source, you need to create columns and bind them to data fields. Create columns and bind them to data fields manually. XtraLayout Suite,XtraLayout Suite,XtraLayout Suite XtraLayout SuiteXtraLayout SuiteXtraLayout SuiteXtraLayout SuiteXtraLayout Suite Data-bound Operation Mode (Details) Layout Converter is Available. DotNetSlackers: Search Check out this 3 minute video on how to bind an ASPxTreeList to data. which are scheduled, but does not happen when I run the packages manually. Data assigned to APSxTreeList created dynamically isn't shown Alternatively, when I create the ASPxTreeList control by dragging it directly into the aspx file and bind the data to the manually created TreeList, it works fine.